A stop at the water park is a great way to cool off on a hot day. Lots of splashes, slides, climbs and interactive fun will keep the children (of all ages) entertained for hours. Every few minutes a giant bucket with gallons of water drenches awaiting guests. Open from late May into early October, provided air temperatures reach at least 65 degrees (our water is not heated). 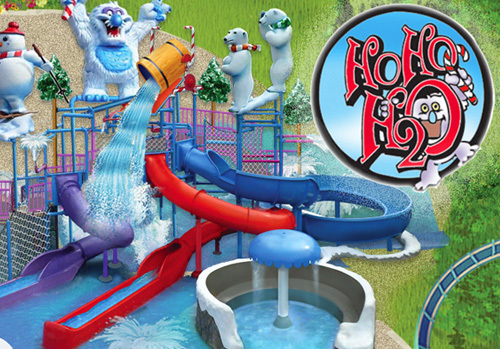 Enjoyment of Ho Ho H2O is included in the price of admission to Santa’s Village. If you’ve forgotten your towel or bathing suit, nearby is the Elfs Lodge Trading Post Gift Shop with all your wants and needs for the day, including locker rentals. The Elfs Lodge also features family changing rooms and rest rooms. The Merry Mess Hall serves lunch, Icees, and ice cream overlooking Ho Ho H2O.